JustChange’s August 2015 grantee, Heartwood House is trying to bring this trend to Ottawa. Heartwood House owns a 26, 000 square foot facility in Ottawa’s east end that houses non-profit and charitable organizations. 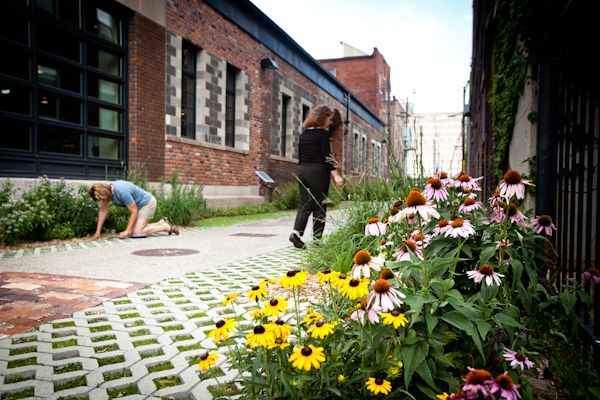 It’s not surprising that an organization of community-minded people came up with the idea to turn their underutilized alleyway into a “green alley”. This will transform an asphalt-paved extension of the parking lot into a car-free, environmentally friendly fully accessible pathway and social place for their McArthur Avenue neighbourhood. The plan calls for enhanced stormwater drainage features — through the inclusion of native plants, herb and flower gardens and permeable surfaces – and upgraded security lighting. By converting this alley into a green alley Heartwood House will create a safe, inviting and ecologically responsible community space. The stormwater drainage features are particularly important in Ottawa because of our well-known problems with sewage and stormwater runoff that pollute our waterways. The Heartwood House project is a great example of how we can reduce the burden on our water infrastructure and ecosystems through the inclusion of permeable surfaces and greenspace while at the same time creating community assets. JustChange would like to invite you to come learn more about this great idea and Heartwood House at JustDrinks on August 5th at Slice & Co. (399 Elgin Street) between 6:00 – 8:00 p.m. – RSVP.